Photo: Da Bia Mountain—you can't miss it. Travel south on Highway 1A from Tuy Hoa to Nha Trang and it’s hard not to notice the distinctive rock formation perched atop the 706-metre high hill. 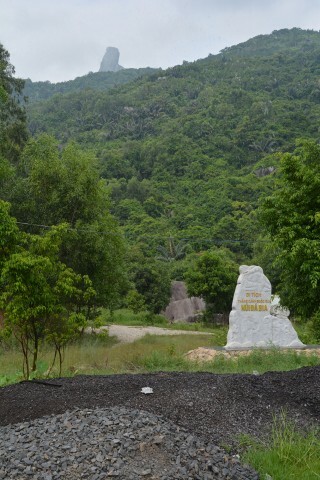 The locals call it Nui Da Bia, meaning “gravestone mountain”. Found on Highway 1A in the area of the Deo Ca Pass, the entrance to the path takes you within 100 metres, vertical-wise, of the summit. Enter through the gate and the stairway that leads to the top is to the left. The road leading to the right heads into a boulder-strewn river valley that’s been developed for visitors. There are also houses built into the rock faces high on the hills of the valley, which are a sight to see. It’s a restful and laid-back spot, and the hike up is a chance to take a break from the road and stretch the legs. It’s hotter than Hades in the summer months, so if heading up try to arrive in the morning. Factor in enough time to return before the park closes. To get here from Tuy Hoa, take Highway 1A south out of town for 27 kilometres. The highway eventually leads to Ca Pass, which winds up and down some steep switchbacks — so steep, in fact, you’re likely to come across quite a few trucks that have broken down trying to make it. Near the top of the pass is the park, just off the highway road.